Yesterday’s fresh new crime fiction, The Incident Of The Churchill Bust, proved to be an illustrative, if irritating, episode in showing just how crass and puerile both side of the EU Referendum debate in this country are becoming. Keen to discredit Barack Obama’s recent intervention in the referendum campaign – which saw Obama firmly endorse a vote to ‘Remain’ in the EU – and paint the President as embittered and anti-British, the ‘Leave’ side pushed a narrative in which he had ordered a bust of Winston Churchill to be removed from the Oval Office to to cop a snook at the United Kingdom. In response, the ‘Remain’ side put about that this never actually happened, referring to it as a ‘myth’. The truth of the matter, of course, was neither one thing nor the other. Obama himself seems to have confirmed that he did in fact have one of the two Churchill busts in question removed – but that this was not out of any disrespect for Churchill, or for Britain generally. And yet, both the Leavers and the Remainers have seized upon this completely innocuous, barely relevant story and wrung its neck until it appears to support their case. With a full two months yet to go in this campaign, it is depressing to see both sides fixating on such a triviality. If every tiny murmur of a story is going to make both camps work themselves into a lather simplifying and twisting each detail to make it appear favourable to their cause, I don't know how much more of this I'll be able to take; far from ‘engaging’ me in a question of national importance, such petty bickering over nothing makes me want to knock all their heads together and call the whole thing off. Oh god, can’t it just end? It wasn't that long ago that I was beginning to think Nico Rosberg – talented racing driver though he undoubtedly is – would never win a Formula 1 World Championship. It wasn't because he wasn't good enough (he quite clearly was) or had the right car – Mercedes GP has been the team to beat over the past few seasons. But so often recently, he just hasn't quite seemed to have the ruthless 'edge' that a true champion needs. Rosberg's success in the early part of this year is all the more remarkable because of this. We are talking about a driver who has spent most of the last two years living and racing in the shadow of one of F1's most flamboyant and polarising characters – and one of its most naturally aggressive and stylish wheel-to-wheel racers – in Mercedes team-mate Lewis Hamilton. There is no question in my mind that, psychologically, this will have taken its toll on Rosberg. Even in the final races of last season, when we were treated to a small preview of the Rosberg dominance that was to follow in 2016, it would've been easy to dismiss the German's six consecutive pole positions and three wins as being the result of Hamilton's subconsciously relaxing sightly having already secured his third world title. But this year, with the scores reset, and everything up for grabs, Rosberg has been quickest out of the blocks in the first few races of the season. A hat-trick of wins has allowed him to stamp his authority on the 2016 season right from the start. Slow to start, and plagued by reliability issues, Hamilton has already slipped to a thirty-six points behind his team-mate, and with a whole lot of work to do already just to claw back that deficit and be in a position to defend his Championship title. There will, of course, be plenty who are still to be convinced by Rosberg's credentials as a potential World Champion – and the job is far from done, despite his blistering start this year. Expect Lewis Hamilton to fight back, as any great racer would, and expect Rosberg to have his own fair share of technical difficulties; this is not over yet, by any means. But I think it is to Rosberg's credit that he has refused simply to play second fiddle to Hamilton for a third year running. I wrote last year (in what is, incidentally, one of my most-read Formula 1 posts ever!) that, having been beaten to the title by his team-mate once, Rosberg looked as if he felt like a 'number two driver', and that translated to racing like one; I said he needed to rediscover his faith in his own abilities. He is making a strong statement now that he has done that – that he is more than just a 'number two driver', but someone who has confidence in who he is and his own style of driving once again. Now, he is out to show his critics that he does have 'what it takes' to challenge for supremacy within the team, and ultimately, to be a Champion – and I, for one, find that seriously impressive after so much time spent barely being able to get close to Hamilton. All of which is setting up a very interesting situation for this season's racing. And what could be better than that? Well, to end on one of my constant refrains about racing – the best bit of all is that it is real, not artificially created in a lab by Bernie Ecclestone and his nefarious henchmen engineering the situation. Thank heavens for that! I had never heard of this sandwich brand before, but even in the packaging this looked promising – two well filled sandwiches, and a good colour to the bacon which seemed to suggest quality ingredients. I was not disappointed. BLT is a classic sandwich recipe – almost every sandwich brand makes one. I have tried many different BLTs over the years, but this is up there with the very best of them. The bacon is crispy, but not tough, and nicely flavoursome; there is a good balance of ingredients, and no overmayonation; the salad is fresh and the bread is not soggy. 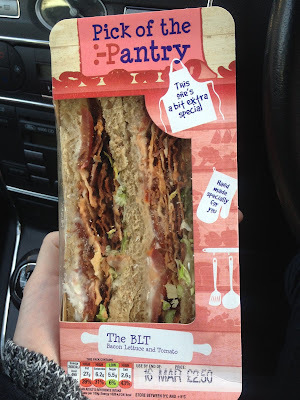 Overall, this was a very enjoyable sandwich experience, and I would buy this sandwich again.